2005 sees the 60th anniversary of VJ Day. 20% of Japan's prisoners died in captivity compared with 4% of Germany's. 12,000 FEPOWs died building the Burma - Thailand railway alone, and up to 100,000 native labourers. Surviving The Sword features the POWs in their own words and drawings. 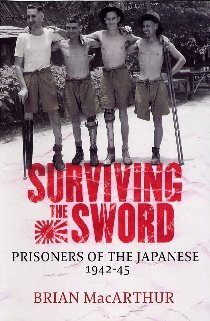 The prisoners of the Japanese in the Second World War are often forgotten; for most Britons, the war ended in May 1945. As we approach the sixtieth anniversary of Japan's surrender in August 1945 and as the surviving Far East prisoners of war (FEPOWs) enter their eighties and nineties, it is time their story was told. Many FEPOWs were so scarred by their experiences that they could not even discuss them with their wives and close family. The treatment they encountered was brutal beyond imagination - Japan flouted almost all the significant rules of the Geneva Convention. Instruments of torture included thumbscrews, pieces of sharpened bamboo and whips. Among the punishments were severe beatings; being made to stand to attention for hours on end, sometimes holding lumps of wood or other heavy objects above the head; having to beat up another prisoner; and solitary confinement in tiny cells for weeks at a time. Guards were entitled to kill prisoners without reference to higher authority. Diet and conditions were appalling, and disease and illness rife. Those who survived did so by summoning up the deepest resources of the human spirit. Surviving The Sword details the inspirational ways the men boosted their morale. They set up universities; organised plays and concerts (in one case strings for violins and banjos were made from signal wire and the men smuggled in two pianos, a drum kit and a sewing machine for costumes); constructed secret radios at risk of execution; made cigarette papers out of torn-out pages of the Bible; and discovered ingenious methods of brewing alcohol (e.g. bamboo bedposts were filled with water, a handful of rice and a rotten banana). They also derived huge satisfaction from sabotaging the projects on which they laboured and by outwitting the Japanese. More than 150 diaries and archives - concealed in a variety of ingenious places such as the tubing of stethoscopes or beer bottles buried in graves - are the basis of the book, complemented by many personal accounts. Brian MacArthur is associate editor of The Times. He was deputy editor of The Sunday Times and founder editor of Today and The Times Higher Education Supplement. Hardback - Price £20.00. Available from all good bookshops.